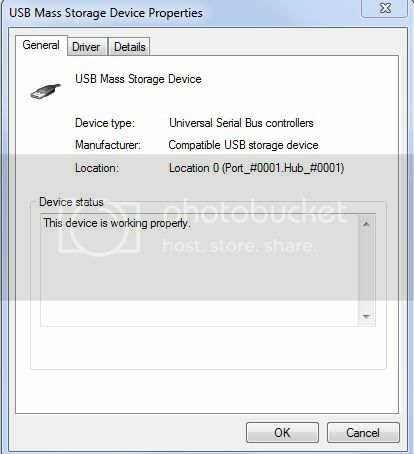 After a power surge on hub port when attaching a card reader to a front USB port one of my external hard drives disappeared. The drive works fine and is now on another USB port. I have tried uninstalling/reinstalling the driver and disabling/enabling, rebooting etc and it still will not work. How do you know there was a power surge at this time? I am not sure your first screen shot is of the port, I note it says device. But I agree, the location looks bad. Have you totally shut "off" your computer? Not just reboot, or "shutdown", but totally off by unplugging from the wall (or setting the master power switch on the back of your PSU - IF it has the option - to off). This is the only way to totally remove all voltages, in particular the ATX Form Factor required +5Vsb standby voltage PC power supplies supply when the computer is simply shutdown (which is really standby mode). Note there are several "Wake on..." commands set in the BIOS Setup Menu that use this +5Vsb voltage to keep various circuits and settings "alive" when the computer is in standby mode. These include Wake on Mouse and Wake on Keyboard - which obviously rely on USB. That means USB ports are still alive even when you have exited Windows and shutdown the computer. If me, I would uninstall your device and the drivers, shutdown, then remove power from the computer for 10 - 15 seconds to ensure all standby settings are released. Then connect and boot and see if the device is detected, drivers load, and it works. I am assuming you have inspected the interior to ensure the necessary wires from the front panel USB ports are securely connected to the motherboard. That said, if by "power surge" you mean the USB connector for the card reader was not perfectly aligned when you tried to connect it and you "shorted" the +5V that was present in the computer's USB port to another contact (possibly seeing or hearing the "zap"), then the controller for that pair of ports may now be bad. Monitor(s) Displays 2 Samsung 2220wm-HAS 22"
I managed to grab a screenshot of the power surge warning (1) but forgot to post the image. I will try the steps you outlined when I'm back home and will post back the results. That is telling me connected devices are attempting to pull more current than the port is capable of delivering. That is not a surge. Generally, using USB devices that have their own external power supplies is best to prevent these type errors. I would totally uninstall the device from device manager; then reboot and let windows re-detect and reinstall and see if that helps to resolve the issue. If you did somehow short out the usb controller on te motherboard as one of the others mentioned; then you may have to replace the controller if that is possible. USB hub port power surge.